Please Sign-in for all practices, it helps to keep the studio running smoothly!! PCC is coming to Near East Yoga!! There’s a total eclipse of the sun happening nearby, on Monday… in case you hadn’t heard. Monday August 20th is a New Moon and a rare total solar eclipse. Please note the special schedule during the next few days leading up to and just after the 2017 Eclipse. Look skyward during our regular practice time and witness la luna passing between the earth and sun. Wear authorized protective lenses. 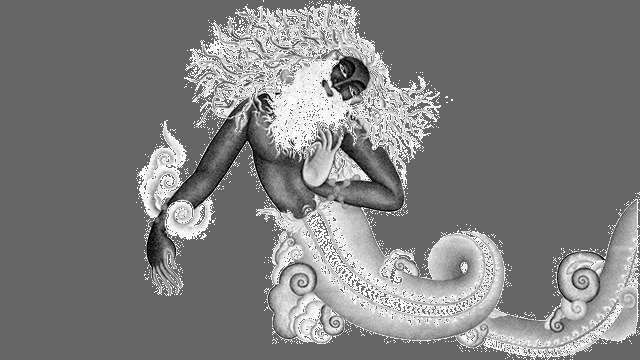 Otherwise Near East Yoga is open for led- classes and will run on the “open practice” method until Wednesday morning. Please see the schedule here to verify the studio hours this week. Thank you for your participation and support as we bring our attention to a rare celestial intersection that, might stop traffic or open doors that seemed otherwise shut. I believe there is a special drishti automatically invoked when our attention has found a focus beyond our domaine, one we will simply ride-out or collect insights about our souls journey- these and other aspects are natural and what may or may not be changed or otherwise revealed will at least be punctuated by a major celestial event right in Oregons back yard. I am so happy we can share this together. Near East Yoga will host Patanjali Now! 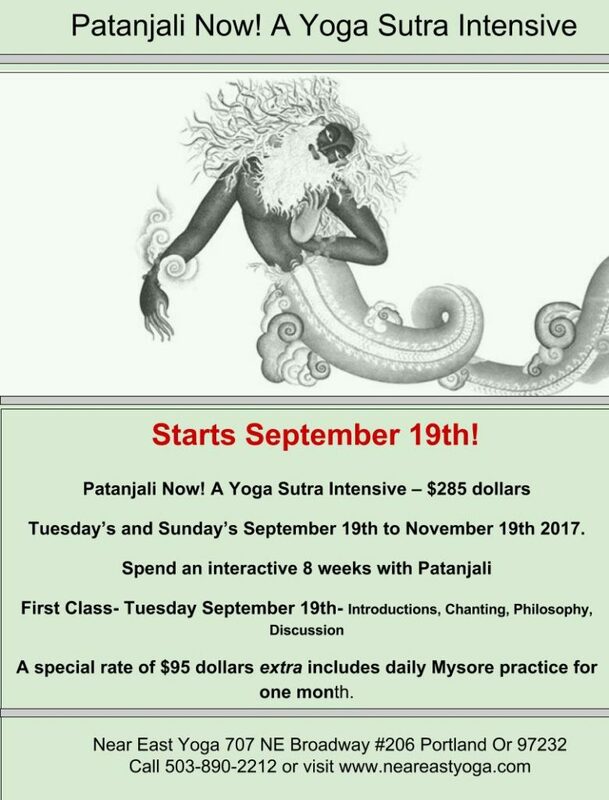 A Yoga Sutra Intensive September 19th-November 19th 2017 this event is non-vinyasa in the classic sense and is open to everyone. If you are a teacher and want to be incorporating Patajali theory into your daily work please read the course info. Click here for those details. Portland Community College and Near East Yoga are teaming up to bring students closer to ashtanga yoga by hosting them in house on Saturdays at 11am of 11 weeks, with all the classes taught by Melissa Pellitier, who has been teaching at PCC and Near East Yoga of over 4 years. This class might be the perfect one for your friend, or spouse. It includes a number of weekly classes at Near East Yoga besides the one on Saturday. So that also makes it a good deal financially and lets Near East give back to the community. Thanks Mel for bringing together. Make sure to sign up with PCC course number 47691. Its also posted here. to sign up- go here to sign up. Jacob Handwerker and I are hosting this event together for the 3rd time. BBHS is an ideal setting for yoga as we know, so through daily practice and amble space to reflect renew and rejoice- out group covers the spectrum with a lot of yoga, soaking, and singing. I hope you will join us- the deposit is the cost of your lodging . sign up soon with BBHS. As I prepare for September 19th’s opening session I am growing in excitement working with this information. Thinking about holding space and time for such an event makes me realize both that I cherish these teachings and to take on learning them is a powerful moment, not one to be wasted, cursory or trivial. A lot of ground we cover will lead to a developing understanding of how to work with Patanjali in our lives. There is much to said for a simple list that can quite convey what we are about to embrace- we need more than anything a few good visits to solidify our view. Opening Session introductions resources, sketching future inquiry with sound. A brief layout of classical yoga and theory paired with contemporary examples and anecdotes. Patanjali, Past and Present : Classical Patanjali and the 21st Century Yogin. Tuesday’s and Sunday’s September 19th to November 19th 2017. A special rate of $95 dollars extra includes daily Mysore practice for one month. OR, mail a $100 dollar deposit before August 10th to reserve a spot. Understanding Patanjali, the revered Sage most associated with yoga philosophy cir. 2000 years ago. The information is so old seems to take nearly half that time to digest, a long while anyway, maybe forever. But not without insight along the way. This workshop/seminar is designed to show the basic structures and connections Patanjali makes throughout the YSoP. Without support we can loose our determination. This does not need be the case if we take the time to keep pressing toward understanding and allow the process of introduction reveal a few doorways of interest that lead deeper into the wonder of a wider knowledge of Patanjali. This is all done via a regular reading and discussion of The Yoga Sutra of Patanjali, and adding in supportive textual references along the way, allowing the experience of understanding to reveal itself to us over time. Having a steady introduction allows a beginning minded person or group a chance to uncover the basics of Patanjali, put them to trial and digest the results then compare notes with other active students. Some of this introduction has already occurred in the form of living life, learning the path of cause and result and learning from our karma which way best suits us and our destiny. Patanjali does less to tell us what to do and more to help us see how we are designed. In a way this is the heart of the yoga sutra- seeing the framework for how we are made and express and developing ourselves as We see fit and as the forces and elements allow. This course will be four-sections, in 14 classes, over eight-weeks. The classes are held at 11am on Sundays and 7pm on Tuesdays. Each 2 weeks will offer time to learn the structure and format that opens up the YSoP for the next part.The classes will include chanting, theory and discussion.There will be, spaced apart, 2 weeks over the time we won’t meet.Relevant handouts will be offered weekly and an opportunity to write about the experience will be introduced. Every week offers a Friday 9am make up session. If this workshop is attractive and you have the time please contact Near East Yoga to submit a $100 dollar deposit by September 10th and to receive further instructions and information. I hope this change in the lunar year finds you well. Keeping with the theme of my prior post, I’d like to bring up the change in cycle as an opportunity to review and take action/ inaction regarding the fruit available to act upon when spring approaches in March and beyond. The Solar new year six weeks ago came with a very durable snow and for me one of the worst colds I have a had in many years and a lot of time for reflection . Although short, the cold was quite potent and caused my body to really kick into gear and heal. I feel in someway purified in many levels and ready for what happens next. Sort of like what happens when I practice yoga- but way more intense and fast. Many of my thoughts have been turning toward the energy moving in our culture and the sudden and stark reveal of how the vulnerable people are deeply affected by the change in political landscape. It is not lost on me the beauty and grace of an enhanced space such as Near East Yoga, becoming more of a refuge everyday, offering a safe place to develop stability and grace. I have a firm resolve to support and engender unity and community as an act of rebellion to what I see going on on the Federal stage. As it goes I have been aware of peoples need to grieve as they move toward resiliency and revolution. But also morph into resolve and strength. Yoga, if anything is a confirmation of a personal domaine for the purposes of revealing the divine through anything that comes up. Everyone is entitled to pursue this end as a function of their freedom and happiness. Let’s work of for this as we explore our practice. Under the effect of the lunar new year, now is a great time to recommit to the channelizing and stabilizing effort found in regular practice. I’ve been watching a new found strength erupt out of people, some affected by the storm, or the state of the population and the spark of late winter sun. There is a lot of joy floating about stemming from steady yoga practice and heart-lightening song-circles. In a way we offer each other a protection that comes from just being present and available- even in the silence of Mysore. You are not alone and there is very little to be said. This is called trust and is the root of who we maintain a sangha. Come be together, strong and clear through practice. Happy New Year! The Holidays sort of just came and went. They were wonderful to behold and I was happy to see you all during these special times. I have been left with the overwhelming sensation that we have entered a new chapter of life with this turn of the earth, a beginning to a new age where we are going to utilize our potency and power of adaptability, for and along side each other. Witnessing the state to where the world has arrived, I am even more grateful for community, the stories we share, the places we inhabit and the home we make together here in this great City of Portland. As these new ways of how we relate with our environment are revealed to us, as we shift and grow, I keep reminding myself that following the old ways certainly has it’s merit. When properly blended with the widsdom of the times the root teachings of what we call yoga, offer space, clarity and vision that can be an antidote to what ails or an engine of transformation. May we all be the bearer of this result in the world. The Near East Yoga sangha is a beautifully diverse group of mindful individuals, each a servant to others, Self and the Divine, who shares this self-effecting method for making better the organization of maya or the illusion of being. The community shares a trust which is a precious item to behold and is a principle component in how we express and enjoy liberty. The animation of a good life can come when we know not only who we are, but also how we are and where we are, in a world where to try is to succeed, if the method is there. Four walls don’t make a yoga studio alone- the many different threads of lives and choices, successes and sufferings are what make the fabric with which we live and love. “Grist for the mill” as Ram Das has said is of a turn, the very prana we employ in the simplicity of breath and the base of all our actions. We are friends with the lineage of being blessed with success, if we try- its what the Elder’s wanted for us when they sought the truth and tried to map thier way, to then offer us. Patanjali wanted us to succeed, Pattabhi Jois, Dr. Jayashree, Kathy Cooper, our first teacher, the other yogi in the room, the Godhead- all are bent on helping us find the path and take it alone for the sake of all everywhere and the ultimate destination of Now. As this year of 2017 gets rolling, look from where you have come, and the strength or even the stretch by which you came through and know you can and will stay upright this year. Look to the Sun, Moon and Earth to show you the passing of the high and low, move with them like a living vinyasa, keep your drishti both internal and external, breathe in the free air, be the seer, held in spontaneous awe of the magic found in the mundane. Release the unnecessary hooks that the illusion has over you and polish the ones that serve and support. The future brings the Lunar New Year at the end of January and then Mahashivaratri in late February. Near East Yoga will continue to offer the support of Ashtanga Yoga, weekly philosophy discussions, special visiting teachers, music and chanting, with new opportunities to engage and explore the dharma-arts as a community. “Get Your Bhajan On VI” and the 2nd Annual “28 Days of Kirtan” complete with a 3 night retreat at the Oregon Coast are pending in late winter. The weekly chant sessions continue in vigor and a special night version of the YSoP group will be starting on Tuesday’s at 4pm. We are bringing back the Beneficial Sounds Gong Bath with Wayne Marto every month and have a few Tea and Meditation Ceremonies with Leora in the works. Combined with such a great group of supporting teachers Melissa, Martina, and Brady (including the great fill in teaching of Dena and Jordan) and the stewardship of Cameron, Near East Yoga is set to be a home for many wonderful experiences for our community. Thanks for making Near East Yoga the hub of your asana practice, even your day or your life (like me). It would never be as it is with our your presence. Thanks for showing up and improving what would otherwise be just a room. Friday September 30th is the new moon. There will be no 7am group led class but the Yoga Sutra of Patanjali study is scheduled for 9am as usual. This is the second new moon for September. I’m not aware of any special significance but it seems rare none the less. Keep in mind we sing 4 times a week and all are welcome to attend these sessions. We make special considerations to incorporate the novice chanter so please feel welcome. These sessions are intended to be a chance to connect to the community and learn about yoga theory while opening up channels in the body only available through song. See the schedule for details. No reservation is required. 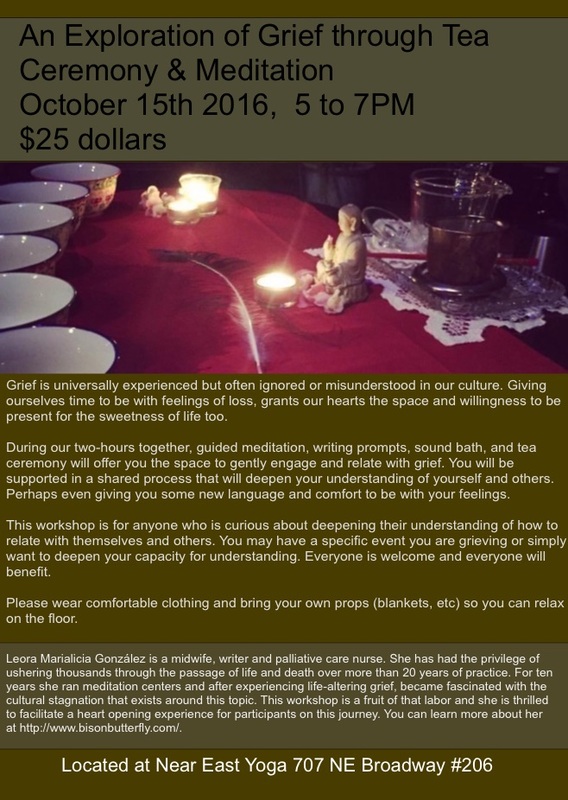 On October 15th (the full moon) from 5-7pm, Near East Yoga will host “An Exploration of Grief through Tea Ceremony and Meditation”. Please see the attached flier for information about the session and Leora Gonźalez, the facilitator. Please inquire with me if you’d like to sign up. Now is the the time to book your accommodations for the Breitenbush Hot Springs hosted by myself and Jacob Handwerker, October 30th through the 4th. We had a great time last year and I look forward to a repeat. Hope you can make it. Here is a link to the Breitenbush Hot Springs website for more info about making a reservation. Last Tuesday at 6am, roughly approximates the 6 month mark for the current version of the Near East Yoga Hanuman Chalisa sadhana. After a well attended start the practice has dwindled down to the most devoted. we have taken to singing in harmonies and even recored a session. Since its a permanent addition to the schedule and a remaining part of “28 Days of Kirtan” dating near the end of the lunar year 2015, it’s never to late to come join us who hold it dear. 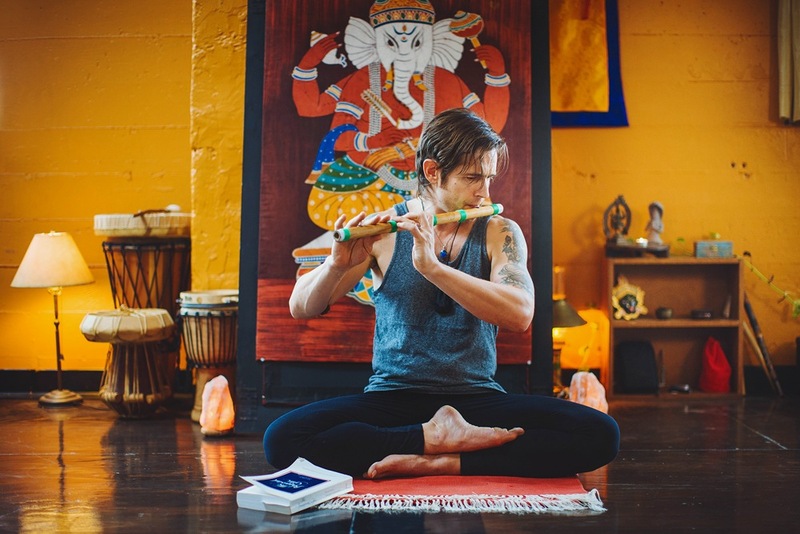 As a personal practice, the song has been in my body, speech and mind for 13 years, coming to prominence as I began my study of the deeper connections of chanting, yoga philosophy and Sanskrit. The Chalisa or 40 verses, a Hindi poem about the auspicious deeds of Hanuman, attracted me, like many others, due to the resonating tones of Krishna Das and the mystery surrounding yoga as a workable philosophy hidden in a foreign language. It is still a work in progress that never fails to reveal itself as I grow with it. When it finally dawned on me that to learn Hanuman Chalisa would require a lot of effort, I took to chanting it 7 times a day, every day for 7 months until I could sing along unprompted and eventually learn in by heart. In the beginning it was nearly impossible to shape my mouth to make the right sounds but eventually I learned and have been helping others work with it in different incarnations for a decade. Many of you hold it dear as well and it’s a part of how our group practices. Our tradition of Ashtanga yoga holds it in its heart do to a New York City connection that the folks I learned the method from brought to Portland back in the late 1990s. Krishna Das and the Jivamukti Center in NYC were instrumental in establishing kirtan as a vital part of Ashtanga Yoga. Tim Miller, one of the founding American teachers of Ashtanga Yoga holds the Hanuman ethic in the form of “Service to God” through yoga teaching and support and he has been an inspiring light to many Ashtangis through his unswerving dedication. For me, in my early service to yogis, the fables of Hanuman, his discovery of his latent abilities though his service and devotion to Rama related in the Hanuman Chalisa became a personal code and a secret mission I continue to this day. Having just completed my college years in the time leading up to the start of Near East Yoga, one of the final classes I took was a seminar on leadership. The resonating feature of this experience was that to lead was to serve. Holding space for Ashtanga Yoga allowed me to serve without really knowing where it was all going. The adage of Sri K Pattabhi Jois “do your practice, all is coming” allowed me to focus on the method and keeping the room clean and open. The rest, Yoga Sutra, Kirtan, Bhagavad Gita, the nature of the sangha and how my life unfolded has developed on it’s own, naturally over time. The Hanuman Chalisa opened me up to keeping the work pure and simple, to protect the door and support the yogis within. Two verses, 21 and 30 have been like mantra to me as they describe how Hanuman guards the door of Rama and protects Sadhus or holy practitioners against demons- take the later part as metaphor for distraction or dilution and you can understand the effects of 15 years of just a simple practice. I always say thanks Guruji at this point. When it comes to service, his ethic to serve the practice and all is coming continues to reveal his shining face smiling down on us. As it often feels like this whole yoga thing is just getting traction, I look forward to serving anyone who finds benefit in what Near East Yoga has to offer however simple. 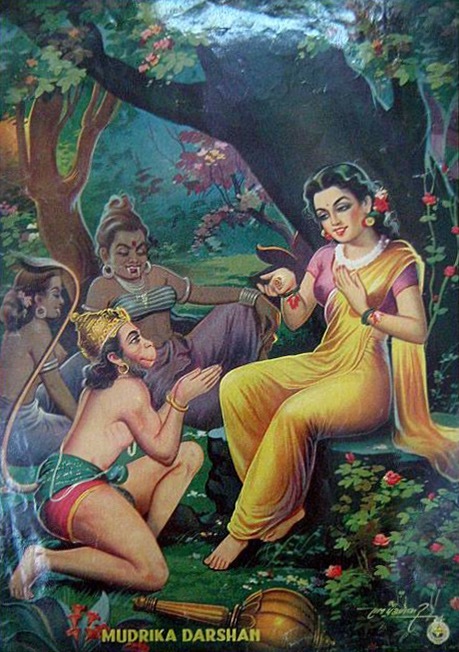 Lastly and what inspired me to write this post, relates to the photo below of Hanuman revealing to Sita, imprisoned by Ravana in his luxurious garden in Sri Lanka, Rama’s ring that signified that Rama was searching for her and she should be inspired to be soon found and not give up hope. He appears to her (9th verse) in what the Chalisa states as Shooksma-rupa or “tiny-formed” referring to one of his many powers of manifestation. As a student of the hidden meaning in ancient verses, Hanuman here teaches that sometimes small is the most potent form when a special meaning is being passed among intimates. For me the teachings of of yoga and dharma are so soft and subtle that often we only find them out when we have grown quiet, maybe lonely, waiting in the garden of our own oppression wondering why we have been forgotten, when in that very moment a small gesture from a devoted being saying be not afraid, I come as an emissary from the Beloved who right now is looking for you- which to me says a lot about integrating our inner-self with the moment and being right sized in our expectations of the aggregate of the human condition. For now, may we all grow small and be powerful and open to revelation in our own way. Just to reiterate the potency of this workshop, I will offer bit more perspective. For one thing- It’s free. And needs to be free. There is nothing to buy and no status to be gained in the realm of the materiel for this workshop. These teachings go back further than our teachers, teacher and simply serve to transport the ego to it’s ultimate destination- the knowledge of the unadulterated original self. The teacher is an Indian woman, Phd Ayurvedic doctor with a Masters degree in Bhagavad Gita and Sanskrit and has chanted it by heart since childhood. The offering is pretty strong, all 700 hundred verses in proper meter, tune and enunciation, twice a month over 4 months. The in-between weeks will be practice and make up sessions, so everyone can participate. 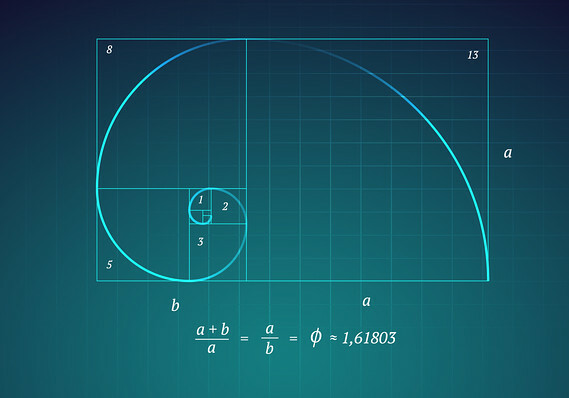 Did you know the singing of this song reflects a higher math contained in the recitation that transcends even the meaning of the content? Read the Bhagavad Gita and you will see that the content is profound- after this recitation ends in November we will be set up to have our weekly discussion and have the original wave form of the Gita resonating in our hearts and minds. For me, the host to a community of yogi’s, the importance of investing in the heritage teachings of classical yoga and uphold the tradition, make it available to the sangha, is the cornerstone of why Near East Yoga can be the place that it is. Contemporary yoga practices of the modern variety, while useful for all reasons we can see, tend to emulate and peak at the place where this sot of yoga begins. Because many contemporary yoga practices are divorced from the heritage connection, they rely on the method of exercising away the crazy mind, to cut its fruits off at the surface but never grasp the workings of how the mind-root can be explored and extracted. The Bhagavad Gita offers this insight and the methods for exploration simply by it’s intonation. The concepts and practices of these heritage teachings is the method of esoteric exploration that can at once fulfill our desires while showing us the deeper meaning behind why we are drawn to yoga at all. Take this time to become renewed and established in this heritage teaching of classical yoga. You won’t be disappointed. If you read this far, please RSVP in this forum. I’m making chai and prasad for the event and would like to know how many to plan for.